An Integrated Music Environment, powered by Csound. 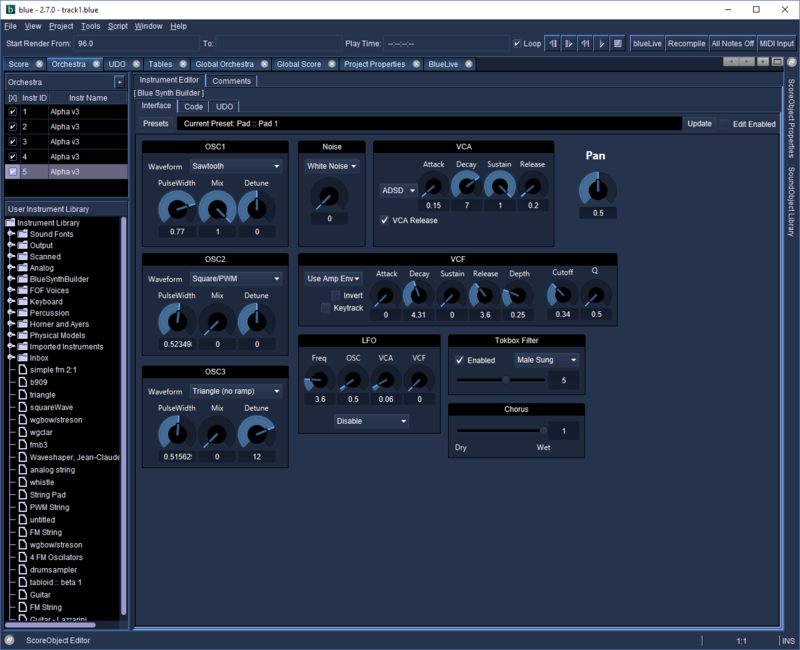 Blue is an open-source, cross-platform desktop application for composing music. Use visual tools together with text and code to create the music of your dreams. You will also need to install a 64-bit Java 8 JDK (Java Developer Kit) to run Blue. The recommended version is Oracle JDK 8. (OpenJDK is also suitable. Some Linux repositories package JavaFX separately from the main OpenJDK package. Be sure to install both openjdk and javafx.) Later versions of Java are not currently supported at this time (i.e, 9, 10, 11). Polyobject are objects which hold other SoundObjects, and have timelines in themselves. Working within them on their timelines and outside of them on the parent timeline helps organize and understand the concepts of objective time and relative time between different objects. 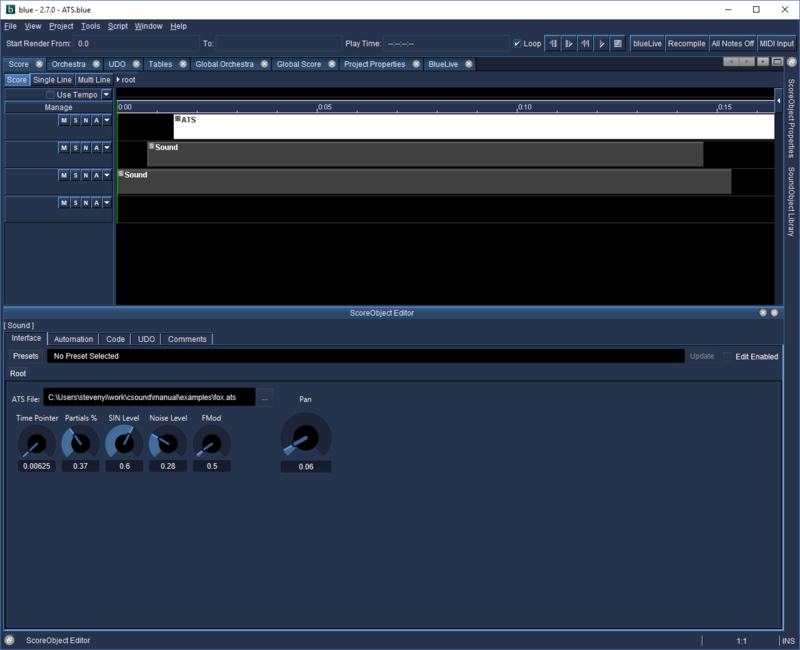 The soundOject library allow for instantiating multiple copies of a SoundObject, which allows for editing the original object and updating all copies. 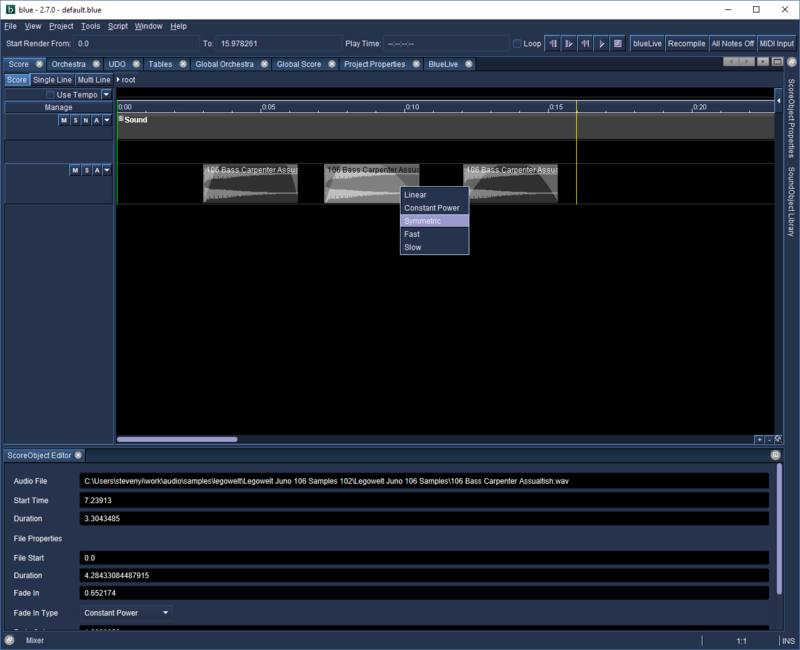 NoteProcessors allow for modifying the SoundObjects score results, i.e. adding 2 to all p4 values, multiplying all p5 values by 6, etc. These NoteProcessors can be chained together to manipulate and modify objects to achieve things like transposition, serial processing of scores, and more. The Orchestra manager organizes instruments and functions as an instrument librarian. 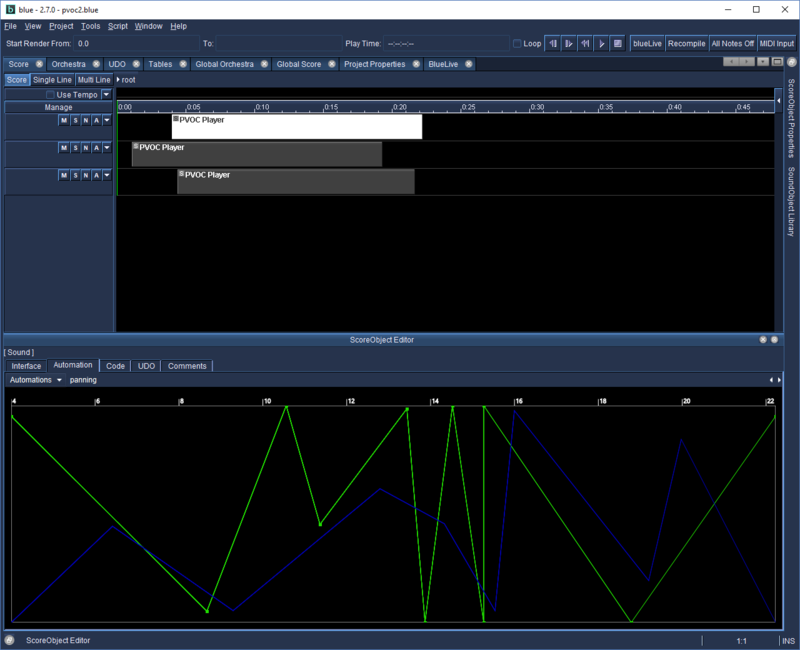 Graphical instruments and effects that help to increase musical workflow. 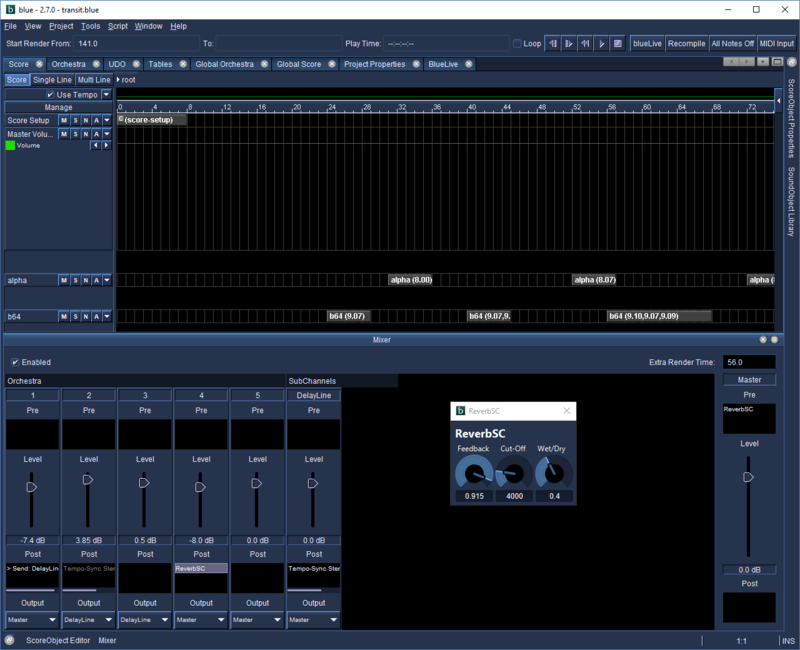 A mixer system and user-interface to easily connect instruments and effects together that follows a conventional mixer pardigm. Syntax hilighting of Csound code. 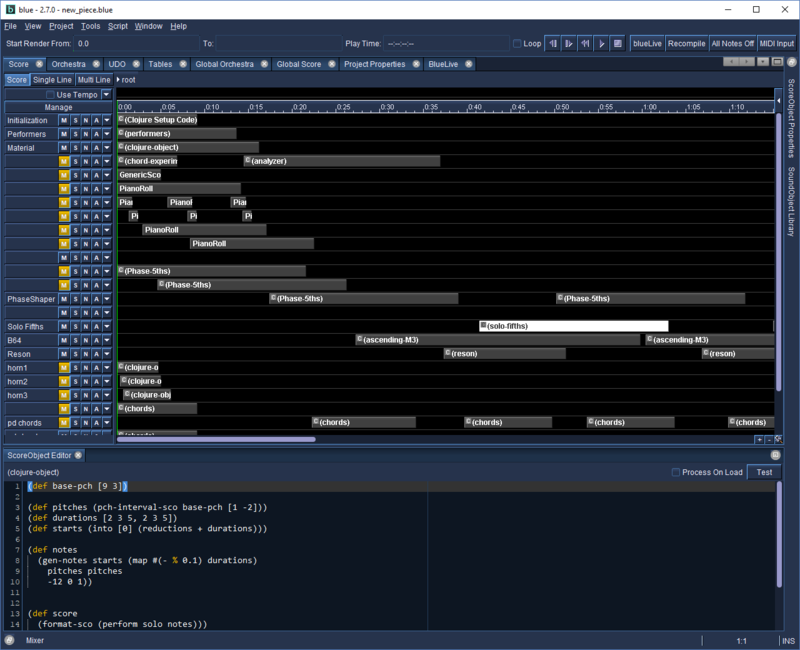 Microtonal support using scales defined in the Scala scale format, including a microtonal PianoRoll, Tracker, NoteProcessors, and more. BlueLive - work with soundObjects in realtime to experiment with musical ideas or performance. Mailing lists are the primary means to discuss Blue. Questions and comments on using Blue should go to the users mailing list while those regarding the development of Blue should be directed to the developer mailing list. Click on the link name below to subscribe or manage your subscription for the list. Click on the archive link next to the list's description to search and view the archive for that mailing list. Did you find a bug? Or want to request a feature? Please use the Github Issue Tracker link below to search for existing issues or file new ones. Your feedback is valuable and contributes to making a better Blue! Thanks very much to Github for hosting the current Blue project site and Sourceforge for hosting the mailing lists and original project site!